(TibetanReview.net, Oct28, 2015) – Delegates representing at least 182 Tibet support groups across India – meaning groups that support the Tibetan struggle against Chinese rule in their homeland – will meet for their fifth triennial conference in Guwahati city in the northeast Indian state of Assam, said the exile Tibetan administration at Dharamshala Oct 26. The statement did not say when the conference will be held, although previously assamtribune.com Jun 27 had cited organizers as saying it will be held over Oct 10-11. 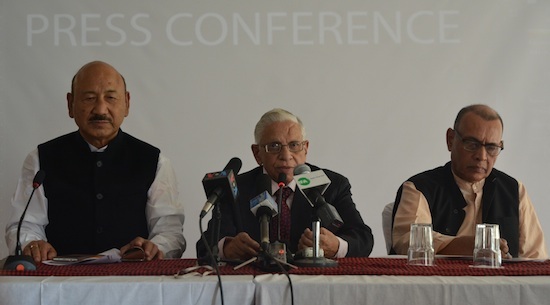 The statement said the holding of the 5th All India Tibet Support Groups’ Conference was announced at a press conference at Dharamshala on Oct 23. It was jointly presided over by Dr N Kishor Trikha, National Convener of the Core Group for Tibetan Cause; Mr RK Khrimey, former state minister and national MP from the state of Arunachal Pradesh, and Dr Anand Kumar, Professor at the Jawaharlal Nehru University, New Delhi. The exile Tibetans’ Information and International Relations minister, Kalon Ms Dicki Choyyang, and International Relations Secretary Mr Sonam Norbu Dagpo attended the press conference. The speakers have focused their talks mainly on the environmental devastation in Tibet under Chinese rule that have severe repercussions in neighbouring and downstream India. “What is happening in Tibetan plateau is something unthinkable in a civilized society. Never has an entire nation fallen on the verge of being decimated by an occupying power,” Dr Trikha was quoted as saying. And Prof Anand Kumar was reported to have pointed out that China’s incessant environmental degradation in Tibet had inflicted phenomenal damages to societies, nations and ecology, especially the river and glacier systems affecting over 1.5 billion people. The speakers have appealed to the Indian delegations attending the United Nations COP21 meeting in Paris to draw focus on the environmental devastation taking place in Tibet. Mr Khrimey has given an outline of the forthcoming conference and spoken about its contribution to helping to create awareness about the Tibet issue.